town, Free State prov., E central South Africa, part and seat of Dihlabeng local municipality. It is situated in a farming and livestock area and has industries producing furniture and food products. Bethlehem was founded in 1860, and its main growth began after the railroad from Natal (present-day KwaZulu-Natal) reached there in 1905.
city (1990 pop. 105,090), seat of Lehigh co., E Pa., on the Lehigh River; inc. as a borough 1811, as a city 1867. The largest city in the agricultural and industrial Lehigh Valley, it is a commercial, financial, and government center. ..... Click the link for more information. ) and incorporated as a borough in 1845. Steelmaking began in the early 1870s, and Bethlehem Steel's structural-steel mill opened in 1908; in 1995, when it closed, the steelmaking era ended. Many of the mill's huge buildings remain in the city; the National Museum of Industrial History is house in one. In Bethlehem is the Moravian Museum, which incorporates the Gemeinhaus (1741); the Central Moravian Church (c.1803); and the Schnitz House (1749). An internationally famous spring music festival performed by the Bach Choir (1898) is held in the city. Bethlehem is the seat of Lehigh Univ. and Moravian College. ..... Click the link for more information. . It is traditionally considered the birthplace of Jesus and is one of the world's great shrines. Situated on a hill in green, fertile country, Bethlehem looks across to the Dead Sea and beyond. Its inhabitants, who are Muslim and Christian Arabs, depend largely on pilgrims and tourists for their livelihood. Handicrafts, fashioned from olive wood and mother-of-pearl, embroidered goods, and religious articles are made in the town. Bethlehem is also the trade center for surrounding farming villages and for the pastoral nomads who inhabit the area. book of the Bible. It tells a story, set in the days of the judges, of the fidelity of a Moabite widow (Ruth) to her widowed mother-in-law (Naomi). After the death of her husband in Moab, Ruth returns with Naomi to Bethlehem. There Ruth marries Naomi's kinsman, Boaz. , in the Bible, wife of Jacob and mother of Joseph and Benjamin. She is one of the four Jewish matriarchs. An alternate form is Rahel. , A.D. 76–138, Roman emperor (117–138), b. Spain. His name in full was Publius Aelius Hadrianus. An orphan, he became the ward of Trajan. Hadrian distinguished himself as a commander (especially in Dacia) and as an administrator. , in Greek mythology, beautiful youth beloved by Aphrodite and Persephone. He was born of the incestuous union of Myrrha (or Smyrna) and Cinyras, king of Cyprus. Aphrodite left Adonis in the care of Persephone, who raised him and made him her lover. ..... Click the link for more information. . In 315, Constantine destroyed the grove and constructed the Church of the Nativity (completed 333). The church, rebuilt and enlarged by Justinian I in the 6th cent., is now shared by monks of Greek, Latin, and Armenian orders. The place where Jesus was born is said to have been in the grotto under the church. Saint Jerome lived (386–420?) in the court of the church and produced there the Vulgate text of the Bible. From 1099 to 1187, Crusaders controlled Bethlehem, and in 1571 the city was annexed by the Ottoman Empire. It was part of the British-administered Palestine mandate from 1922 until 1948, when it became part of Jordan. 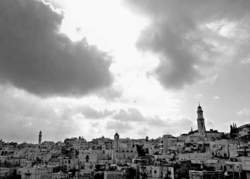 After the 1967 Arab-Israeli war, Bethlehem was part of the Israeli-occupied territories. Palestinian refugee camps were located nearby. In Dec., 1995, Israeli troops withdrew from Bethlehem as part of the process of establishing Palestinian self-rule in the West Bank, but the city was the scene of Palestinian-Israeli fighting in the renewed conflict that began in 2000. See N. Blincoe, Bethlehem (2017). Bethlehem's Old City as it appears today in Israel. AP/Wide World Photos. Bethlehem means "House of Bread." The earliest mention of this famous town is in the Amarna letters of the fourteenth century BCE. They mention an early Hebrew settlement—"Bit-Lahmi" (Bethlehem) that "has gone over to the Apiru" (Hebrews). Less than three hundred years later it was the birthplace of King David, who won fame by slaying Goliath and began his rise to power. A thousand years after that, Bethlehem became immortalized as the birthplace of Jesus of Nazareth. With shepherds and kings leading the charge, tourists have filled its streets ever since. Dozens of Christmas carols have waxed eloquent over its "dark streets" shining with "the everlasting light," which makes recent tragedies it has witnessed seem ironic, to say the least. Because Bethlehem is a Palestinian city, it is frequently the scene of Palestinian celebrations—and just as frequently a scene of Israeli and Palestinian violence. In April and May 2002, the cathedral built to honor the traditional place of Jesus' birth became a fortress, surrounded by an Israeli army, defended by Muslim soldiers, whose wounded were tended by Christian priests and nuns—truly the dark side of ecumenical relations. In 1 Samuel 16:1 Jesse, the father of the Jewish king David, is called a Bethlemite, and from the time of David’s reign (tenth century BCE), Bethlehem had special recognition as the city of David’s birth. It is so identified in Luke 2:4, where Jesus’ birth in the city contributes to the Christian affirmation of Jesus’ kingship. No one actually knows where Jesus was born, but a small cave that at one time functioned as a stable became the spot most identified as the site. Following the acceptance of Christianity during the reign of Constantine (r. 306–337) in the fourth century, church leaders began to claim the site and initiated construction of a large basilica. By the end of the century, the town had become a major Christian pilgrimage destination. The Church of the Nativity has survived many political changes, including the taking of Palestine by an expanding Islamic empire, several crusades, and the emergence of the modern state of Israel with the allocation of some land to the control of the Palestinian Authority. Bethlehem is in the land under the Palestinian Authority, although only a few miles outside of modern Jerusalem. As the twenty-first century began, Bethlehem was the site of an increased level of fighting between Palestinians and Israelis. In 2002, ongoing conflict led to a thirty-eight-day siege of the Church of the Nativity as Israeli troops attempted to capture Palestinian fighters who had taken refuge inside the church. Chapel of the Kings (where tradition says the Three Wise Men worshiped the infant Jesus) before going downstairs to the Grotto of the Nativity, where a star marks the very spot where many believe Jesus was born. One interesting feature of the church is the so-called Door of Humility. The main door into the church was partially blocked in the sixteenth century to keep people from coming into the church riding their horses. Today, one has to lower one’s head to enter. Similar to several other sites in the Holy Land, the church represents a matter of conflict between older Christian groups. In this instance, the Franciscans (Roman Catholics) vie for control with the Greek Orthodox Patriarchate of Jerusalem. The church is also visited regularly by Muslims, who honor Jesus as a prophet as well as his mother, Mary, both of whom are mentioned in the Qur’an. Jews also visit the church, but many Orthodox Jews refuse to enter as lowering their head to go through the entrance is interpreted as bowing their head before a Christian holy site. Close by the Church of the Nativity is a small cave formed in a deposit of chalk. The cave became an early focus of Marian devotion, and a legend survived that the white of the cave came from Mary having dropped some of her milk on the stone. To this day, local mothers will scrape small quantities of the chalk to mix in their babies’ food. Though not as sacred as Jerusalem, the land in and around Bethlehem is remembered for its part in the life of Jesus, and nearby one may find locations that are believed by many to be places mentioned in the Bible. One may be shown the tomb of Rachel marked by the Dome of Rachel (cf. Matthew 2:18) just north of the city, the well from which David’s warriors brought him water, and the field where the shepherds were visited by the angels announcing Jesus’ birth. Crowfoot, J. W. Early Churches in Palestine. Oxford: Oxford University Press, 1941. Hoppe, Leslie J. The Synagogues and Churches of Ancient Palestine. Princeton, NJ: Liturgical Press, 1994. Raheb, Mitri, and Fred Strickert. Bethlehem 2000: Past and Present. Heidelberg: Palmyra, 1999. Both Gospel accounts of Christmas state that Jesus was born in the town of Bethlehem. Bethlehem is located in the Palestinian Authority, within the modern nation of Israel. The city of Jerusalem lies just five miles to the north. The town's name means "house of bread" in Hebrew, reflecting its location in a fertile zone of the Judean desert. One of the greatest heroes of the Old Testament, King David, was born in Bethlehem. Both gospel accounts of Christmas assert that Jesus was a descendant of David. In fact, in the Gospel according to Luke this ancestry indirectly caused Jesus to be born in Bethlehem. In Luke's account, the Romans wanted to conduct a census and ordered everyone to return to their ancestral home in order to be counted. This decree forced Joseph and his pregnant wife Mary to travel to Bethlehem. Shortly after they arrived, Jesus was born. The Gospel according to Matthew does not mention the census and implies instead that Jesus' parents lived in Bethlehem. Matthew's and Luke's claims that Jesus had been born in Bethlehem were especially significant to those who knew Jewish scripture, since the Jewish prophet Micah had declared that the Messiah would be born in that town (Micah 5:2). According to early Christian tradition, Jesus had been born in one of the caves that local people used to shelter animals. As early as the second century A . D ., pilgrims began to visit the cave where Jesus was said to have been born. The Roman emperor Hadrian (76-138 constructed a shrine to the pagan god Adonis over this site. In approximately 325 A . D ., after the conversion of the Roman Empire to Christianity, the empress Helena (c. 248-c. 328 to Adonis destroyed and built the Church of the Nativity over the presumed site of Jesus' birth. Almost nothing of this original church remains. It was severely damaged in a war that took place several centuries after its construction. According to legend, Persian invaders were about to destroy the church completely, when they noticed a mural depicting the Three Kings, or Magi, wearing Persian dress. Recognizing that the church in some way honored Persian sages of the past, the invaders spared it from total destruction. The great Byzantine emperor Justinian (483-565 of the Nativity in the sixth century times since then, but its basic design remains the same. The main door to the church, called the Door of Humility, was built so low that people have to bow down to enter. The original purpose of the design was to prevent Muslims from riding into the church on their horses. Because entering through this door requires one to bow one's head, which also serves as a gesture of reverence for this Christian holy site, Jews have traditionally objected to using the Door of Humility. Today the Church of the Nativity is an Eastern Orthodox shrine. The cave in which Jesus was born lies underneath the church. Known as the "Grotto of the Nativity," this underground chamber is a site of intense religious devotion for Christians of many different denominations. In the nineteenth century friction arose over which denomination would exercise the most control over the Grotto. In the midst of this conflict, the star marking the spot where Jesus' manger had lain mysteriously disappeared. Each faction accused the others of the theft. Some writers claim that tensions caused by the star's disappearance helped to provoke the Crimean War. The Sultan of Turkey eventually assisted in resolving this dispute by placing a new fourteen-pointed star in the Grotto. Pilgrims to Bethlehem today can still see this large silver star covering the spot on the floor where, according to legend, Mary gave birth to Jesus. The star bears an inscription in Latin, Hic De Virgine Maria, Jesus Christus Natus Est, which means, "Here Jesus Christ was born of the Virgin Mary." Eastern Orthodox officials share the Grotto of the Nativity with Roman Catholic and Armenian Orthodox clergy. At Christmas time Roman Catholic clergy oversee the Nativity scene, while Orthodox clergy control the altar. In the spring of 2002, Israeli military forces invaded the West Bank town of Bethlehem as part of Israel's campaign to eliminate Palestinian terrorism. Dozens of people sought refuge in the Church of the Nativity, hoping that such a holy site would not be attacked. Among them were ordinary townspeople, Palestinian gunmen, and clergy members. The Israeli soldiers surrounded the church and prevented people, food, and medical supplies from entering. After a dramatic five-week standoff, the gunmen agreed to go into permanent exile, and the Israelis called off their soldiers. A few windows were damaged during the siege, but no permanent harm was done to the church. Bethlehem attracts many Christian pilgrims, especially during the Christmas season. The biggest crowds gather on December 24 and 25, when most Western Christians celebrate the Nativity. On December 24 Roman Catholic priests celebrate Midnight Mass in St. Catherine's Roman Catholic Church, which lies inside the grounds of the Church of the Nativity. The event begins with a motorcade procession from Jerusalem to Bethlehem, led by the Latin Patriarch of Jerusalem, the highest-ranking Roman Catholic official in Israel. Those practicing Roman Catholics who have obtained advance tickets for the Midnight Mass crowd into St. Catherine's church. This service includes a procession to the Grotto of the Nativity, where the figurine representing the baby Jesus is placed in the Nativity scene. The throng that remains outside can watch a televised broadcast of the service on a screen set up in Manger Square. Other opportunities for Christmas Eve worship include an Anglican service held at the Greek Orthodox monastery attached to the Church of the Nativity and a Protestant carol service, which takes place at a field just outside Bethlehem. The crowd that assembles in the field sings Christmas carols, commemorating the evening two thousand years ago when a small band of shepherds received a miraculous announcement of Jesus' birth and witnessed a host of angels singing praises to God (see also Gospel According to Luke). No one knows the exact location of the field mentioned in the Bible. At least three different groups have laid claim to their own shepherds' field. The Christmas Eve carol service takes place at the Y.M.C.A. 's field. The Orthodox Church, however, maintains its own shepherds'field, as does the Roman Catholic Church. Bethlehem hosts somewhat smaller celebrations on January 7, when many Orthodox Christians celebrate Christmas, and again on January 19, when Armenian Orthodox Christians observe the holiday (see also Armenia, Christmas in). Jewish and Muslim pilgrims come to Bethlehem to visit another holy site: the Tomb of Rachel. Rachel's death and burial are mentioned in the Bible (Genesis 35:20). Folk tradition declares that Rachel was laid to rest in Bethlehem, although biblical scholars deny that this is the correct site. Baly, Denis. "Bethlehem." In Paul J. Achtemeier, ed. The HarperCollins BibleDictionary. Revised edition. San Francisco, Calif.: HarperSanFrancisco, 1996. Brockman, Norbert C. Encyclopedia of Sacred Places. New York: Oxford University Press, 1998. Christmas in the Holy Land. Chicago: World Book, 1987. Clynes, Tom. Wild Planet! Detroit, Mich.: Visible Ink Press, 1995. Del Re, Gerard, and Patricia Del Re. The Christmas Almanack. Garden City, N.Y.: Doubleday, 1979. Norris, Frederick W. "Bethlehem." In Everett Ferguson, ed. Encyclopedia ofEarly Christianity. Volume 1. New York: Garland, 1997. Weiser, Francis X. The Christmas Book. 1952. Reprint. Detroit, Mich.: Omnigraphics, 1990.
a city in Jordan, south of Jerusalem. Population 22,500 (1964). In ancient times Bethlehem was a Canaanite city and later a Judean city in southern Palestine. It was probably founded around the middle of the second millennium B.C. and was first mentioned in the so-called Tell el-Amarna tablet in the 14th century B.C. as “Batilu-Laham” (“The home of the goddess Lahamu”). It was sometimes called Bethlehem of Judea to distinguish it from a city of the same name in northern Palestine. According to the testimony of the Bible, Bethlehem (in the Slavic version of the Greek transcription, Vifleem) was the birthplace of King David. It was also the site of an Adonis cult. In evangelical tradition, the city was also the birthplace of Jesus Christ, who is considered to be a descendant of David and therefore to have had his origins there. But because, according to a different, equally mythical version, Jesus’ parents lived in Nazareth (in northern Palestine), the Gospel of Luke adduces the fantastic story about the journey of Joseph and Mary from Nazareth to Bethlehem (Vifleem), in connection with the decree of the Roman deputy Cyrinius providing for a census of the population to be taken according to the place of residence of one’s ancestors. Preserved near present-day Bethlehem is David’s Well, which is mentioned in the Bible. It is a cistern cut into the hills for the purpose of collecting and storing rainwater. Christmas Eve or the Vigil of Christmas represents the culmination of the Advent season. Like Christmas itself, Christmas Eve celebrations combine both religious and secular events. Perhaps the most widely anticipated by children is the arrival of Santa Claus—known as Sinterklass by the Dutch settlers of New York, who were the first to introduce the idea of St. Nicholas's annual appearance on this day; the original Santa Claus was the tall, saintly looking bishop, Nicholas of Metz. It wasn't until the 19th century that he became the jolly, overweight, pipe-smoking figure in a red fur-trimmed suit that children in the United States recognize today. The modern Santa Claus was largely the invention of two men: Clement Moore, who in 1822 wrote his now-famous poem, "A Visit from St. Nicholas," and Thomas Nast, a cartoonist who did numerous illustrations of Santa Claus based on Moore's description. In any case, it is on Christmas Eve that Santa Claus climbs down the chimney and fills the children's stockings that have been hung by the fireplace mantel. Before going to bed children around the world leave milk and food out for the one who brings the presents, be it Santa Claus, the baby Jesus, the Christmas elf of Denmark, the Christmas goat of Finland (called Joulupukki ), or the Swedish tomte, or little man, who resembles Puck or a leprechaun. The midnight church service celebrating the birth of Jesus Christ is the main Christmas Eve tradition for many Christians of all denominations and even of non-believers, especially if there is a good organist, soloist, or choir. In most European countries, a large but meatless meal is eaten before church, for it is a fast day. Some families, especially those with grown children, exchange gifts on Christmas Eve rather than on Christmas Day. Caroling—going from house to house singing Christmas carols—began in Europe in the Middle Ages. The English brought the custom to America, where it is still very popular. In Venezuela, after midnight on Christmas Eve, crowds of teenagers roller skate on the Avenida de los Caiboas. After an hour or so, they attend a special early mass called Misa de Aguinaldos, "Mass of the Carols," where they're greeted at the door with folk songs. Then they skate home for Christmas breakfast. In Newfoundland and Nova Scotia, Canada, mummers, or belsnickers, go from house to house. Once inside they jog, tell licentious stories, play instruments and sing, and generally act up until the householder identifies the person under the mask. Then the mummer takes off his or her costume and acts like a normal visitor. In the 19th century, in what is now New Mexico, bundles of branches were set ablaze along the roads and pathways. Called farolitos and luminarias, these small fires are meant to guide the Travelers to the people's homes on Christmas Eve. Residents are ready to give hospitality to anyone on that night, especially Joseph and Mary with the Christ Child. They wait in faith for the Travelers' three knocks on their door. But modern fire codes overtook the ancient faith, and firefighters began to extinguish the small piles of burning pine branches for fear a spark would start an inferno. Small brown paper bags partially filled with sand and holding a candle eventually replaced the open fires. Inevitably merchants began to sell wires of electric lights to replace the candles, and plastic, multi-colored sleeves to imitate lunch bags, and the modern luminarias began to appear at holidays like Halloween and the Fourth of July. Last-minute shopping is another Christmas Eve tradition, and stores often stay open late to accommodate those who wait until the last minute to purchase their Christmas gifts. In Buddhist Japan, Christmas Eve is for lovers, a concept introduced by a Japanese pop star and expanded by trendy magazines. It is a Western rite celebrated with a Japanese twist. The day should be spent doing something extra special (expensive), and should end in a fine Tokyo hotel room, most of which have been booked since the previous January; even the cheapest rooms go for exorbitant prices. Being alone on this night is comparable to being dateless on prom night in the United States. Uncle Chimney is the Japanese version of Santa Claus. Youngsters may be treated to a $29 (or more) barrel of Kentucky Fried Chicken (10 pieces of chicken, five containers of ice cream, and salad) if their parents don't mind lining up for two hours. The reason for the chicken is that many Japanese think Colonel Sanders resembles Santa Claus. Another culinary tradition is strawberry shortcake with a plastic fir tree on top. This was introduced 70 years ago by a Japanese confectioner as a variant of plum pudding. While the origins of this form of Christmas are unclear, many people say it dates from the 1930s, well before the United States occupation in 1945 after World War II. On Christmas Eve in Armenia it is traditional to eat fried fish, lettuce, and boiled spinach. The spinach is eaten to pay tribute to the Virgin Mary, who, according to legend, ate spinach on the evening before Jesus' birth. After a morning church service on Christmas Day, the men exchange brief social calls and are served coffee and sweets. On the third day after Christmas, it's the women's turn to make and receive calls. Many people in Estonia attend church on Christmas Eve. The holiday dinner, which follows the church service, typically includes roasted pig's head or blood sausages, turnips, and potatoes. For dessert there is cranberry soup, and of course plenty of Estonian vodka, which is made from the potatoes for which the country is famous. Many of the Christmas tree ornaments are edible, and real candles—often made by dipping a lamb's wool thread into hot sheep fat—are used to light the tree. In Latvia, the tree is the only Christmas decoration, and it is laden with gilded walnuts, artificial snow, tinsel, small red apples, and colored candies. After the traditional Christmas Eve dinner, which consists of roast pork, goose and boar's head, and little meat-filled pastries known as piradzini, the candles on the tree are lighted and the gifts piled beneath it are distributed and opened. In Lithuania family members break and consume delicate wafers, or plotkeles, on Christmas Eve as a token of peace. The family puts a little hay under the tablecloth as a reminder that Jesus was born in a stable. The kucios, or Christmas Eve supper, consists of fish soup followed by cabbage, fried and boiled fish, sauerkraut, and a huge pike served with a hearty, dark gravy. Dessert is kisielius, a pudding-like dish that is composed of cream of oats, sugar, and cream. Located only a few miles from Jerusalem in an area that is part of the biblical land of Palestine, Bethlehem is known as the birthplace of Jesus and has long been regarded as a holy place by Christians. A church was eventually built on the site, and the crypt beneath it, known as the Grotto of the Nativity, is reputed to be the site of the original manger. Because there have been so many arguments over the years about which Christian church should control the sanctuary, it is jointly owned by the Armenian, Orthodox, and Roman Catholic churches. A Roman Catholic mass is held there at midnight on Christmas Eve, and because pilgrims from all over the world attend, most of them end up watching the service on a large closed-circuit television screen in nearby Manger Square. The highlight of the service occurs when a carved wooden figure of the Christ Child is laid in a manger in the Grotto of the Nativity. Protestants hold an outdoor service in Shepherds' Field where, according to tradition, the shepherds kept watch over the flocks on the first Christmas Eve. The celebration of Christmas in Denmark actually begins on Little Christmas Eve (December 23) and continues well into the New Year. It is customary to make enough apple fritters on Little Christmas Eve to last three days. In rural areas, farmers tie a sheaf of grain to a pole in the garden so that the birds can feed from it. Even city dwellers tie bunches of grain to their balconies. The traditional Christmas Eve dinner starts with risengr+d (rice porridge). Like Christmas puddings elsewhere, there is an almond hidden inside the porridge. Whoever finds it receives a prize. The risengr+d is followed by roast goose stuffed with prunes and apples and decorated with small Danish flags. After dinner, family members often dance around the Christmas tree, sing carols, and exchange gifts. The Julenisse, or Christmas gnome, is a small bearded man dressed in gray with a pointed red cap who, according to Danish legend, lives in attics or barns and is responsible for bringing a family good or bad luck. On Christmas Eve the Julenisse is given a generous portion of risengr+d with an extra helping of butter. Before sitting down to the traditional Christmas Eve dinner, many Finns go to church and place flowers and lighted candles on the graves of departed family members. Then the family gathers around the table and listens to the head of the household read a Christmas prayer. The meal itself includes lipeäkala (the Christmas fish) and ham, various breads, a kind of plum cake known as torttuja, and the traditional rice pudding in which an almond has been hidden. According to superstition, the boy or girl who finds it will be married before the next Christmas. The tree is decorated with homemade paper or wooden toys, gingerbread cookies, gilded walnuts, and other treats. Christmas Eve church services in Paris can be quite elaborate, while those in rural areas of France are usually very simple. No matter where it takes place, the Christmas Mass involves burning candles, Christmas carols, bells, and a creche or miniature Nativity scene. Most homes also have a creche. In Provence, the creche includes not only the Holy Family, but small clay figures called santons representing traditional village characters—the butcher, baker, basket maker, flute players, etc.—who come to adore the infant Jesus. In Marseilles, there is a Santon Fair in the weeks preceding Christmas that is attended by people from all over Provence who want to purchase the traditional santons, made from molds that have been used for generations. After the midnight service is over, families return to their homes for the rÉveillon, or traditional Christmas Eve meal, which includes pâtÉ de foie gras, oysters, blood sausage, pancakes, and plenty of French wine. It is customary for the newspapers to calculate how many kilograms of blood sausage have been consumed at rÉveillon. Many families serve goose because, according to a Provençal legend, the goose clucked a greeting to the Wise Men when they drew near the baby Jesus. In France children leave a pair of shoes out for PÅre Noæl, the French gift bringer, to fill with treats. In some parts of France, people celebrate Christmas Eve with the FÉte des Bergers, the Shepherds' Mass or Shepherds' Festival. The event revolves around a procession led by shepherds and shepherdesses dressed in traditional, local costumes. A simple farm cart, led by a ram, is decorated with bells, flowers, and candles. The shepherds and shepherdesses put a lamb in the cart and lead it in a procession around the church. Then a shepherd picks up the lamb and gives it to the priest, a gesture that is said to represent the offering of a newborn lamb to the infant Jesus. The presÉpio, or Nativity manger, with its miniature figures of the Holy Family, angels, shepherds, and Three Kings plays a major role in the Italian observance of Christmas and is thought to have originated with St. Francis of Assisi more than 700 years ago. The presÉpio is set up on the first day of the Novena (the nine days preceding Christmas); on each subsequent morning, the family gathers before the presÉpio to light candles and offer prayers. Although manger figures are on sale in every market and village fair, in many families the manger is an heirloom that has been handed down for generations. The setting for the manger is usually built at home from cardboard, moss, and bits of twig, and it can be quite elaborate. Christmas Eve is a family affair. After lighting candles before the presÉpio, a meatless meal known as the cenone, or festa supper, is served. It usually consists of some type of fish (eel is popular among the well-to-do), fowl, artichokes cooked with eggs, fancy breads, and Italian sweets such as cannoli (cheese-filled pastry), nougat, and other delicacies. The Yule log plays a more important role than the Christmas tree. The children may tap it with sticks, requesting certain gifts. Few presents are given on Christmas Eve, since Epiphany is the time for gift-giving. The evening concludes with a church service at midnight. In parts of Calabria and the Abruzzi, itinerant bagpipers, or zampognari, come down from the mountains and go from house to house playing pastoral hymns before the homemade mangers. They are given gifts of food or money. Members of the Moravian Church—named after Moravia, a region in the former Czechoslovakia (now part of the Czech Republic)—fled to America to escape persecution in the mid-18th century. They established a number of communities in Pennsylvania, one of which is called Bethlehem and known as "America's Christmas City." As Christmas approaches, the Moravians carry on the Old World tradition of building a Christmas "putz" (from the German word putzen, meaning "to decorate") or Nativity scene, which can range from a simple mantle decoration to an elaborate miniature landscape. On the afternoon of Christmas Eve, they hold a children's "love feast" consisting of music, meditation, and a simple meal—usually sweet buns and mugs of sweetened coffee—served in the church. Then, after dinner, they assemble again in the church for the Christmas Eve Vigil, a service devoted almost entirely to music. The church lights are dimmed and handmade beeswax candles are distributed to the entire congregation while the children's choir sings a favorite Moravian hymn. A similar observance is held in Winston-Salem, North Carolina, now a historical restoration at which the Moravian way of life is preserved. There are a number of superstitions and folk beliefs surrounding Christmas Eve in Switzerland. One is the belief that animals gain the power of speech at midnight on Christmas Eve because they were present at Jesus' birth. Farmers give their horses, cows, goats, and other animals extra food on this night, but it's considered bad luck to overhear what the animals say. Old people claim that they can predict the weather for the next 12 months by peeling off 12 layers of onionskin and filling them with salt. Young lovers who want to find out who they will marry are told to drink from nine different fountains while the midnight church bells are ringing on Christmas Eve. If they rush to the church, their future mate will be standing on the steps. Christkindli, or the Christ Child, who travels in a sleigh pulled by six reindeer, brings Swiss children their gifts. In the area surrounding Hallwil in the canton of Lucerne, a girl dressed in white robes, glittering crown, and a veil portrays the Christ Child. Other children, wearing white garments and carrying baskets of gifts and lanterns, accompany her on her rounds. Some families wait until the Christkindli enters the house to light the candles on the Christmas tree. In many homes the tree is kept hidden until after Christmas Eve supper, when the parlor doors are opened and the tree is displayed in all its glory. In Zurich cakes known as Tirggel, whose main ingredients are flour and honey, are served at Christmas time. The cakes are believed to have originated as a pagan offering. They are made by pushing dough into intricate molds, shaped like characters from folktales, cartoons and other popular subjects. The finished cakes are tough and glossy, so it is not uncommon for them to be kept for months, or even years, and to be used as decorations around the house. Bethlehem, West Bank For many, the idea of Palestinian resistance is synonymous with terrorism, conjuring up images of suicide bombings and rockets. BETHLEHEM, West Bank, May 25 (KUNA) -- Thousands of Christian worshipers from all around the world, as well as various Palestinian areas arrived here on Sunday to take part in a mass, conducted by Pope Francis I at Manger Square. BETHLEHEM, West Bank -- For your next getaway, you might consider this: four nights and five days in sunny Palestine: land of miracles . BETHLEHEM, West Bank -- Former British prime minister Tony Blair is urging people to support the Palestinian economy by visiting the historic sites of the Holy Land and staying overnight in places such as Bethlehem. BETHLEHEM, West Bank -- O Come All Ye Faithful to Bethlehem's first Christmas rock festival. Its local partner is Holy Land Trust, based in the Palestinian city of Bethlehem, West Bank. Normally Israel relaxes permit procedures for entry into Jerusalem during holidays like Christmas and Easter, allowing easier movement for Palestinian Christians between their West Bank homes and the holy places in Jerusalem and Bethlehem, West Bank, and for Israeli Christians into the holy places in Bethlehem.